Tickets will be sold at the door for $10.00. Italian American lunch buffet, coffee and water is included along with home made desserts. Cash bar will be available! One door prize ticket and one auction paddle included with every ticket. Extra paddles can be purchased 3 for $5.00! It takes only a quarter to win! Bring lots of extra quarters! Rolls will be available for sale at the door. Each year the tables fill with tons of gift certificates, jewelry, themed baskets, items from local artisans and more! The Quarter Auction is a day full of fun. laughs and fantastic prizes! Bring the guys, bring the girls and bring the kids! Everyone is welcome! Circle of Hope Breast Cancer Support Group exists for the purpose of fostering a safe, accepting and confidential environment that allows women, in the Kenosha area, to freely express the challenges and concerns that come with a diagnosis of breast cancer. Circle of Hope raises funds that can be passed along to these women and their families who are in need. Our goal is to meet the emotional and financial needs of women going through breast cancer treatment. Together we can alleviate some of their financial burdens. 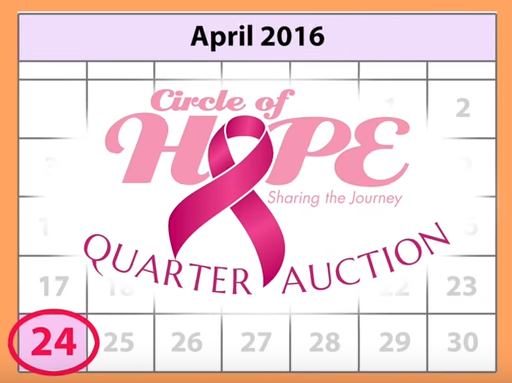 Circle of Hope Breast Cancer Support Group is seeking contributions and prizes of all types for raffles and give-a-ways at our fundraisers.